Can you use image-stabilized lenses with dumb adapters? I'm looking to adapt some lenses unto my M43 body using a dumb adapter, leaving the lens unpowered/uncontrolled. Does it matter if the lens has image stabilization or not? I'm worried that if the lens has no power, the stabilization system will be free-floating and produce bad results. The lens I am specifically looking to adapt is the Canon EF-S 55-250 STM. In order to insure the IS lens elements of Canon EF and EF-S lenses is "parked", the IS needs to be turned off while the camera is powered up before the lens is removed from the camera. Looking from underneath, though, you can see the plastic posts that we sometimes mention. These occasionally break, possibly from shock during shipping. If the IS is not turned off, the lens group is free to bounce in all directions with only the posts to stop the motion. 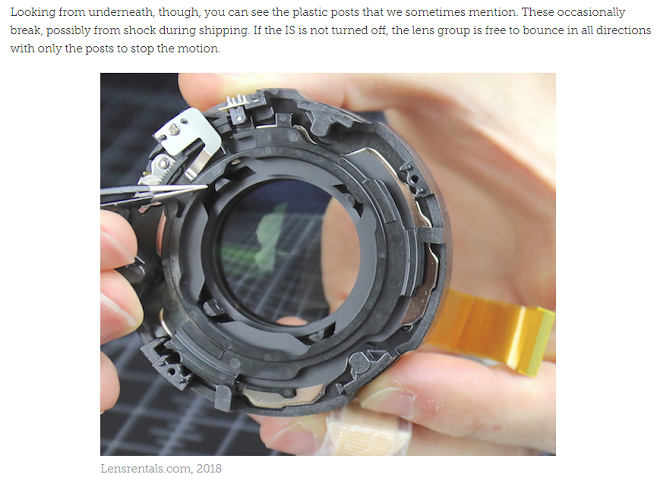 Just because IS is not active and moving the gyros does not mean the IS unit is not free to flop around inside the lens. The proper thing to do is 1) Turn IS off at the lens while the lens is still mounted to a camera. This 'locks' the IS unit in place. If you have IS on and just remove the lens from the camera, then it does not lock and off the camera flipping the switch does no good. You can confirm by gently shaking the lens; there's very little noise if the IS is locked. The locked position is safer for transporting the lens. If it's not locked the IS unit can bounce around and cause damage. How big a deal is it? I can't say for sure, but maybe 1 in 1,000 shipments that come back with IS not locked are damaged. But the incidence is 0 in 1,000; or very close to that, with IS locked. If Uncle Roger says it's safer with Canon lenses to turn off IS and therefore lock it, I'm turning my IS lenses off before putting them away in my bag or case. YMMV. I've used EF/EF-S lenses, including the one you mention, with "dumb" adapters without noticing any particular problems with potentially free-floating elements. However, without electronic control, you cannot stop down the aperture. You'd probably be better off getting a fully manual lens. There are many manual-focus 70-210mm constant F4 lenses that are quite sharp. Regarding the advice to turn IS off while it is still attached to the camera, it might be "safer", and it wouldn't hurt. However, whether it is necessary likely depends on the particular lens make and model. Of the multiple EF/EF-S lenses I have, for which I always leave IS turned on, only one (made by Sigma) makes any "rattling" sound when shaken while detached from the camera. Turning IS off on that lens (while it is attached to the camera) makes no difference. Not the answer you're looking for? Browse other questions tagged lens-adapter image-stabilization or ask your own question. Do adapters exist for old lenses to Canon's DSLR mount? Is it feasible to use a Canon lens on Nikon body for extra macro ability? Are lens adapters with mechanical aperture control really working well? Pentax k-30: can i buy all lens not stabilized? Which lenses can I use with adapters on my Sony A-mount body and what are the disadvantages of such adapters? Can I use adapters to mount Samyang lenses to my Nikon body? Origin of the sound / noise made by some stabilized lenses?